"A 25 mile clover-leaf loop course . . . with roughly 4,975 feet of climb per loop. loose rocks and spectacular fall colors. The race is family and crew friendly!" After participating in this race two years ago, we can vouch for all of the above! 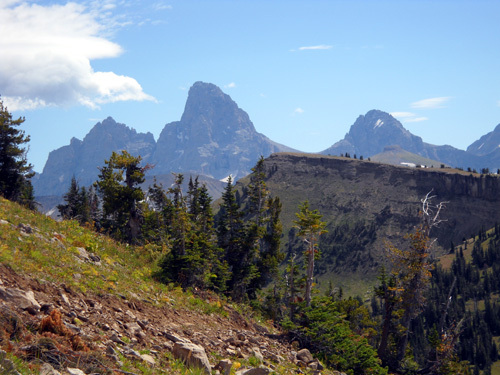 It's definitely mountainous, the running surfaces are varied, the views are awesome, and it is family and crew friendly. It's also one of the best organized ultra marathon races in which we've ever participated. Check my journal entries from September, 2007 and you'll see what a great time we had here before. We had fun this week running on various parts of the course. 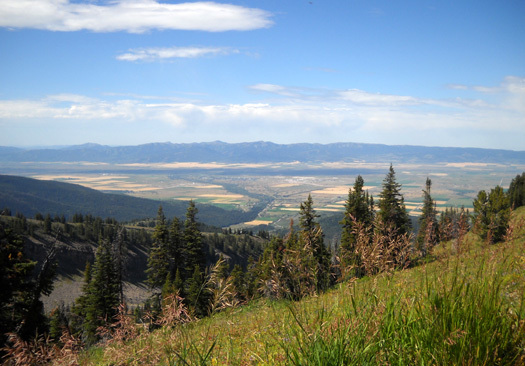 Each 25-mile "loop" consists of three smaller "loops" of varying distances and terrain. This entry will feature photos from just about every mile of the course. I've divided it into two parts because I wanted to include lots of photos. There are more photos on our Picasa site. 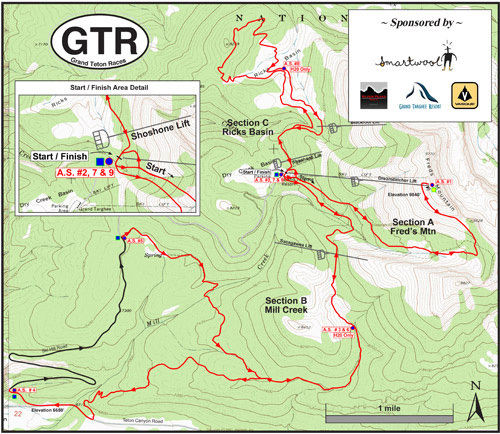 Jim's run all of the GTR course previously but couldn't remember all of it. The course description sounds very confusing just reading it; it's not as confusing during the race, however, because it's so well marked and you know where to go on the second and subsequent loops. In addition, race personnel are pretty diligent about making sure runners go out on the correct loop each time they come into the main aid station at the center of the "cloverleaf." This is especially critical at night in the 100-miler as runners' brains turn to mush. 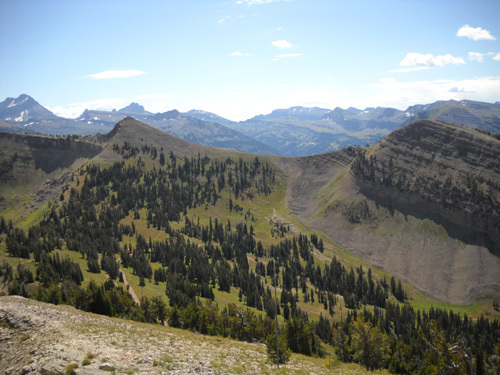 "Base" area at Grand Targhee Resort; the Dreamcatcher chairlift is on the right. Jim is signed up for the 50-miler this time. 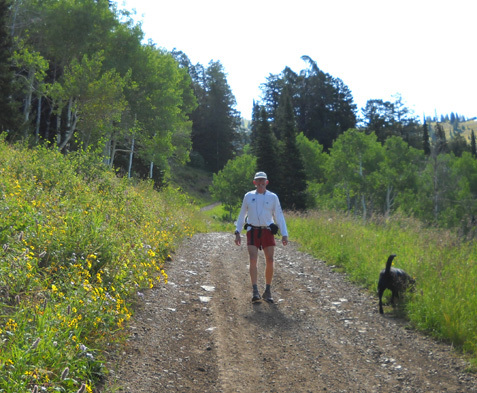 He considers this race a training run as he ramps up for the Bear 100 in three weeks. Although he needed to do a bit of tapering this week before running the 50-miler tomorrow, he wanted to get in more miles than he would if he was peaking at GTR. He's done three familiarization training runs on the course this week, running all but the paved road portions. I saw very little of the course two years ago because I was recovering from a knee injury. I've been very curious to see what everything looks like -- the road up to Fred's Mountain, the Mill Creek Trail, Rick's Basin. Red and black lines = one 25-mile segment in the 50- and 100-mile race courses; repeat as needed. Now that I've either run or driven all but two miles of the course, I know what I'm in for if I ever decide to run the marathon or 50-miler! I'm (wisely) serving as crew again this year, and not entered in any of the four race distances: 100 miles, 50 miles, marathon, or the new 10K that was added this year. After my bike wreck and minimal training the past month, I'm glad I wasn't signed up for GTR because it would have been more struggle than fun. Neither of us has any desire to do the 100-miler here. Four loops on this course are tough for anyone, especially folks our age, despite the generous 36-hour time limit. 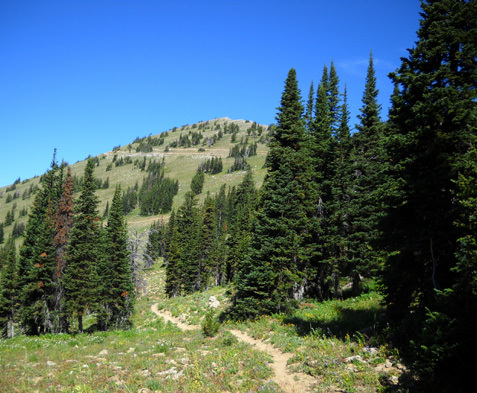 There are almost 20,000 feet of elevation gain and 20,000 feet of loss in the 100-miler. It's still a significant elevation gain and loss, especially at altitudes of 7,000 to 10,000 feet. Jim has concluded that two loops in the 50-miler are challenge enough. After his second arduous climb to the top of Fred's Mountain tomorrow, he'll be relieved to know that he doesn't have to go back up there again. It was during his third grunt up the mountain in 2007 that he called it quits in the 100-miler. 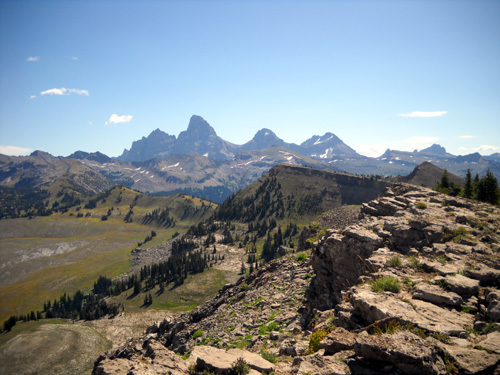 After I climbed to the summit of Fred's Mountain on Tuesday and ran/hiked back down to Targhee Base, I decided even ONCE was too much for me! Going up isn't my problem; it's the long descent for anyone with knee problems as serious as mine. The other two loops don't have as much elevation gain and loss. They wear on runners in other ways, though. Jim turns around for a picture as we begin the climb up Fred's Mountain; soon he was out of sight. I'll describe each of the three loops in the order in which they are run during the race and show you photos I took this week. The course is as beautiful as it is challenging; that's one reason why the number of entrants increases each year. Note that at this time of year there were no sources of water along the course to refill water bottles or let Cody get a drink. We had to carry all of our water. On race day it'll be no problem, as there are aid stations and water drops every 3-4 miles. For each section description, refer to the map above. More details about the course are on the race website. 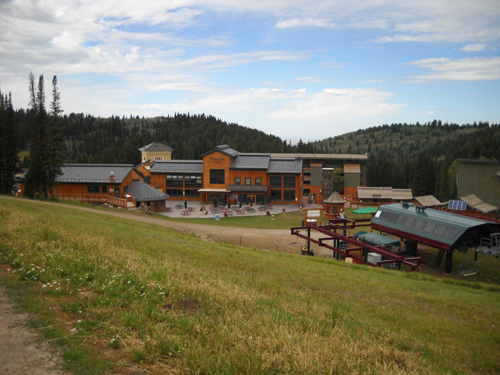 The first loop starts at the Grand Targhee Resort base area (elev. 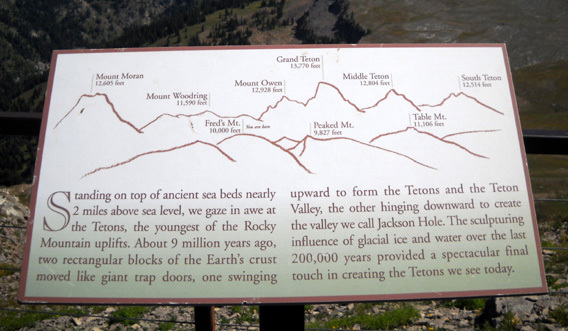 ~ 8,000 feet), just below the Dreamcatcher chairlift, and follows a rocky dirt service road, officially known as the Teton Vista Traverse Trail, to the top of Fred's Mountain (elev. ~ 10,000 feet). Runners check in at at Aid Station #1 and head back down the road to the base area, crossing under the Dreamcatcher lift before reaching the Base Aid Station. It's almost an exact out-and-back, but not quite. Jim's GPS measured this loop at 5.8 miles, a little longer than the official distance. There are some steep grades on this road, however, as well as loose rocks and dirt that weren't as much of a problem for me going up as they were coming back down. I slid around some on the descent. I should have worn my grippy-soled Montrail Highlines that day instead of my Asics 2130 trail shoes. 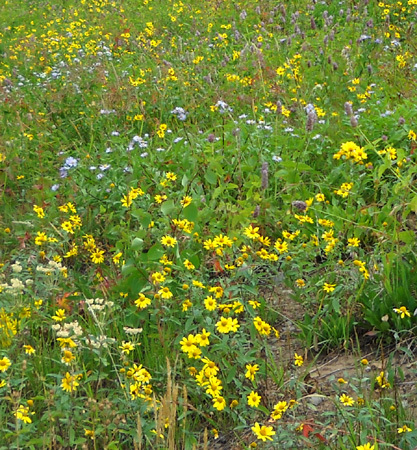 Pretty flowers, scampering marmots, and awesome views helped distract me from the uphill grind, though. 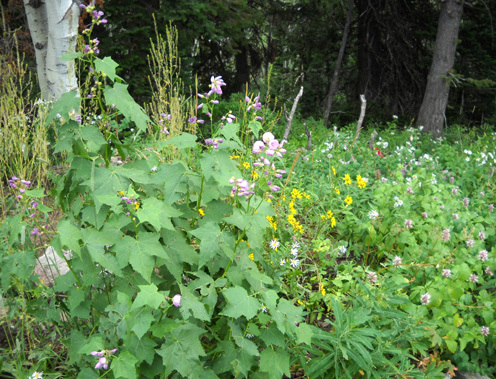 I saw a couple of new kinds of flowers I haven't seen anywhere else in the mountains this summer, and MORE DANDELIONS! I can't believe we're still in the "Dandelion Time Warp" after nine months of traveling this year! Table Mtn. in foreground. Photo taken from the service road on Fred's Mtn. The day we climbed Fred's, Jim was going faster and was ahead of Cody and me. He turned at the building where the chairlift lets passengers out at the summit of the mountain (the location of the aid station during the race) . . .
Cody runs ahead of me to greet Jim after he started his descent on Fred's Mountain.
. . . and returned to Targhee Base so he could more accurately determine how long it takes to do that section on race day. Then he added in another five miles on the Mill Creek Trail. I wasn't planning on running/hiking as many miles as Jim so I had the luxury of spending 15-20 minutes wandering around the summit ridge like we did two years ago when we first arrived at the ski resort. The race course stops a little short of the high point on Fred's Mountain. 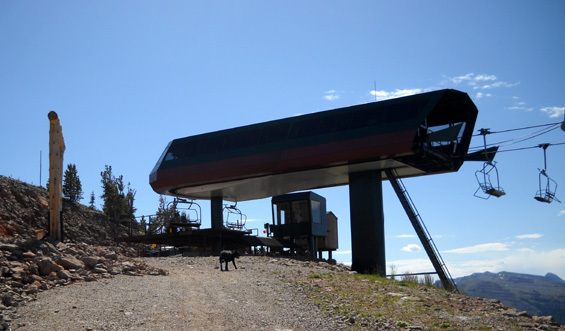 To get the best views, runners and crews should either climb or ride the lift to the top before race day. 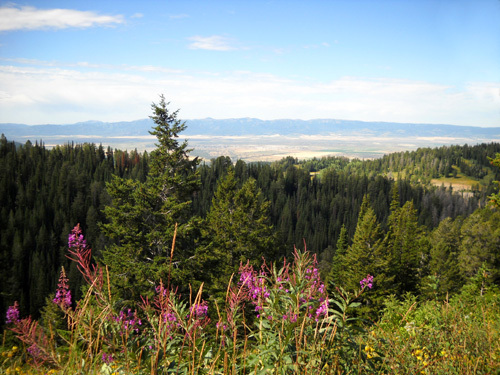 The views down into the Jedediah Smith Wilderness Area and of the western slope of the Tetons from this close are fabulous. My summit scramble turned into a little more excitement than I expected, however. As we passed the chairlift and a little building just below the ridge, Cody apparently got too close to a motion-sensor alarm and set it off! I spent the whole time at the summit wondering if someone would drive up the mountain to see what set it off. Hopefully they had a camera down below that could show them it was just an innocent tourist taking pictures from the ridge, not someone bent on mayhem. Looking down at the service road we took between Fred's Mtn. and Peaked Peak. I took lots of photos that morning -- 110, to be exact! And that was just up and down Fred's Mountain. I took a few more more when I drove down to the bottom of the Mill Creek Trail to meet Jim. He included five miles of Section B into that run and went almost four miles farther than I did that day. Race crew had already marked Section A by Tuesday but Mill Creek and Rick's Basin weren't marked until later in the week. Not that we needed markers for Fred's Mountain, however -- Jim pointed me up the correct dirt road and I simply followed it to the top. I SPY . . . NEW TRAILS! Although I hadn't been up this service road before, I've looked down on most of it and the southwestern side of the mountain from the chairlift and the summit a couple times in 2007. 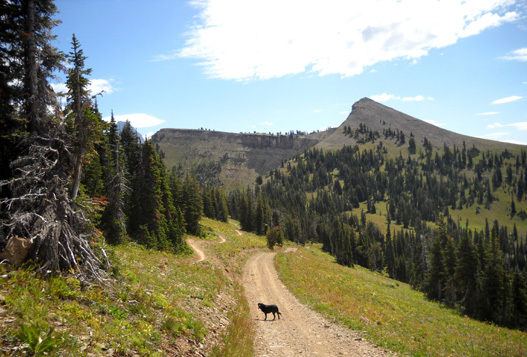 I knew there weren't any nice dirt trails on that side of the mountain then -- but now there are some trails! They cross the service road several times. I noted their locations and read the signs as I hiked up the mountain. Rats. 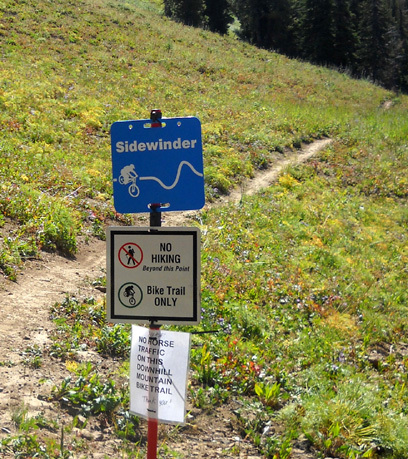 Unfortunately, these lovely trails are only for cyclists, not runners. And only downhill. The cyclists and their bikes hitch a ride up the mountain on the chairlift (I say real mountain bikers would pedal their bikes up that mountain!) and bomb down the trails in protective gear, if they want to live through the joy ride. 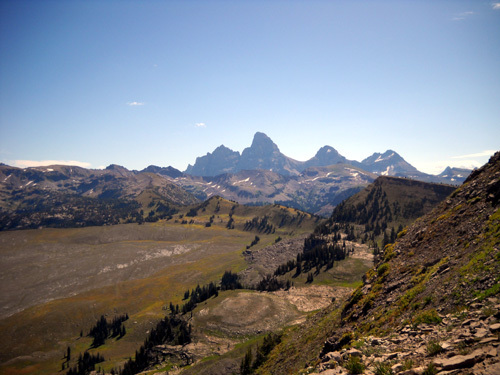 This setup is a good little money-maker for Grand Targhee Resort and fairly cost effective for diehard downhill cyclists who live within a reasonable driving distance. 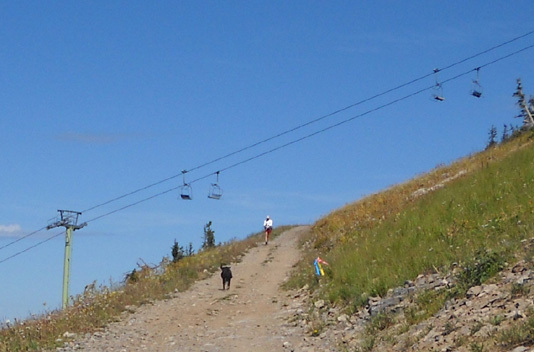 Cyclists (and presumably anyone else) could get unlimited summer chairlift access from June 22 to the middle of September for $99. One single trip on the chairlift costs $15 now, or $20 per day. When we were here two years ago we were able to buy a nice Lunch 'n Lift ticket for only $15;. now it's over $20, depending on your menu selection. 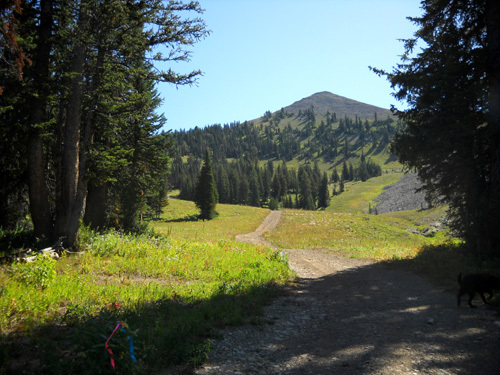 A section of the Sidewinder bike trail, looking up toward the summit of Fred's Mtn. 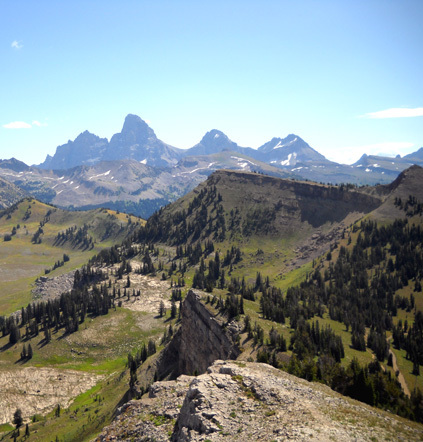 Grand Targhee has a fairly extensive system of hiking, cycling, and equestrian trails. Bikes are allowed on nearly all the trails and roads so we had to be careful all week when we were running on resort property. I hope they aren't a problem for runners in the race tomorrow. The resort really caters to cyclists now, with various bike clinics, group rides, and several races throughout the summer -- including 50-mile, 100-mile, and 24-hour endurance events. I noted on the way up Fred's on Tuesday that the chairlift wasn't operating that morning. It apparently doesn't start until 1 PM on weekdays this time of year, since it's past the prime summer season and kids are back in school. I hadn't seen any folks riding bikes up the road I was on, which is the only other way for cyclists to get up that mountain, so . . .
You must know by now what went through my mind when I saw unused trails! Hmmm . . . it sure would be more fun and easier on my Granny Knees to run down those dirt trails instead of this rocky road! There's a new bike trail (not shown here) just to the right of this road near the top of Fred's Mtn. Yep, I'm a scofflaw. After exploring the summit, Cody and I hopped on the connector trail that parallels the road near the top of the mountain. Then we peeled off onto the Sidewinder Trail, which I'd been admiring from the road on the way up. I later learned that it's rated intermediate difficulty for cyclists. It has more switchbacks and drops more gradually than the "expert" rated Buffalo Drop Trail. 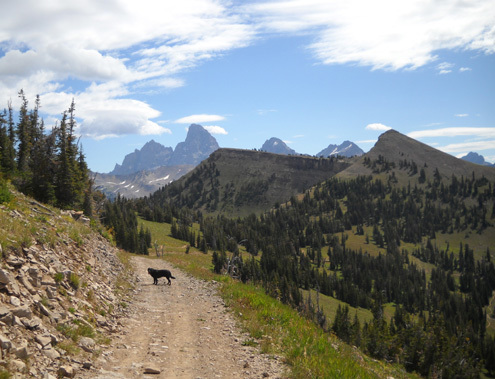 We followed Sidewinder part way down to Targhee Base. Even though I didn't think there were any bikes on the mountain, I turned around frequently to make sure we didn't get run over or get in anyone's way. There was no bike traffic in the vicinity. Since pedestrians are prohibited from using the downhill bike trails, I also watched carefully for resort staff when I was within sight of the road. Two vehicles did go up the mountain about 12:30, shortly before the chairlift was to open, but Cody and I were already back on the road by then. If anyone saw me running the trails via surveillance camera (am I paranoid, or what? ), they didn't say anything. This sign points to Middle Earth, the area between ski runs on Fred's Mtn. and Peaked Peak. 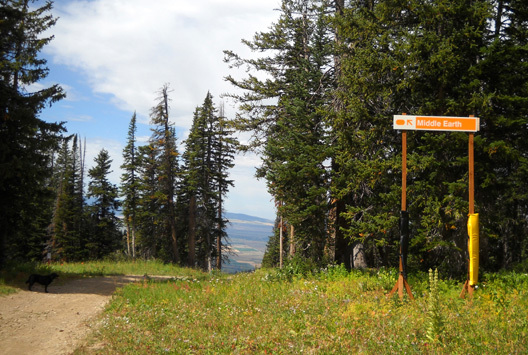 Ski runs have names like Lost Groomer, Crazy Horse, and Wandering Moose. Stealth running! That added even more excitement to the morning's adventure on Fred's Mountain. 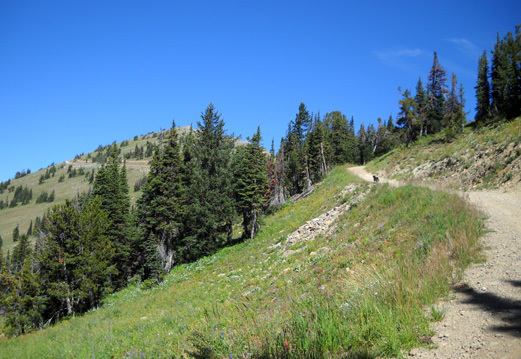 I wish the Grand Teton foot race could incorporate this trail into the official course instead of the rocky service road up to Fred's summit.